John was diagnosed with bowel cancer shortly before Christmas 2016. 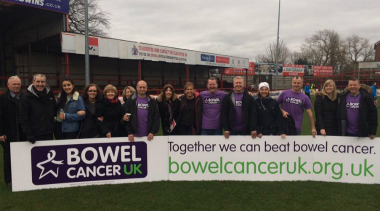 Rather than put everything on hold whilst he underwent chemotherapy, he threw himself into a campaign that began with the purchase of an advertising board at Altrincham Football Club's J.Davidson Stadium. Explaining why he chose Alty's Moss Lane venue as a launchpad, he said: 'My niece goes out with footballer Kyle Brownhill, and when he joined Alty we decided to start watching their games. The first was on Boxing Day, and I noticed a prostate cancer advert on the far side and a gap just to the right of it. I just thought what a great opportunity to get the message across about bowel cancer and the importance of catching it early. It needed paying for, of course, but one of my pals, Billy West, suggested a weight loss competition for January, with each competitor putting in £25 and the winner getting a bottle of champagne. Family and friends donated as well, and we raised £265. The sign should have been £350, but the guy who did it, Joe Faulkner of Sign and Display in Gatley, kindly made up the shortfall. I just want to get the message across that early detection is paramount. I thought I was fine, but I started having irregular bowel movements and feeling some restriction, so I had a colonoscopy and a tumour was discovered. I'm halfway through chemo, and hopefully it has been caught early enough. A massive thank you to John and all his family!